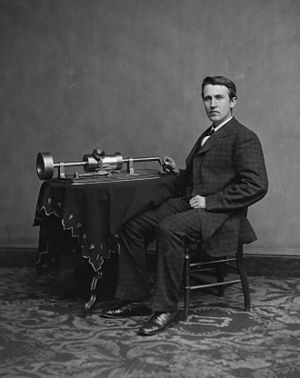 Thomas Edison and his early phonograph. Cropped from Library of Congress copy. (Photo credit: Wikipedia) Public Domain. Venus at 9 degrees is conjunct Pluto at 8:27 pm Wednesday. Venus with Pluto says obsession to the point of destroying the one who rejects you, like in the movie “Fatal Attraction”. This Venus is searching for the soul mate who will complete her life. Venus at 10 degrees Capricorn sextiles Saturn in Scorpio at 11:03 am Thursday. Venus-Saturn aspects can be very positive, adding stability to romantic or financial arrangements. Venus also helps Saturn types to gain a little social skill, such as schmoozing with the higher-ups. The Sun is conjunct Mercury at 28 degrees Capricorn at 3:56 am Friday. A key point in the economic cycle, so keep one eye on the stock market and other indicators this week. If this falls on natal Sun or Mercury, you may be asked what you think about an issue, so have those note cards handy. Mercury enters Aquarius at 2:25 am Saturday, and the Sun enters Aquarius at 4:52 pm. Mercury in Aquarius, like all air-sign planets, is very objective, sometimes to the point of being detached. Mercury here is also capable of recognizing and encouraging the individuality of others; some people can even reach a level where they are empathetic with others. Sun in Aquarius is able to lead without dominating others, possibly because they often handle things with a sense of humor and a humane perspective. Sun Aquarians can gain the cooperation of others by making people feel included in the management of the group. Famous people with Mercury in Aquarius include: Jackie Gleason, Thomas Edison, George Washington, FDR, Mia Farrow, Pope Pius XII, John L. Lewis. Famous people with Sun in Aquarius include: Charles Dickens, Thomas Edison, Abe Lincoln, W C Fields, Carol Channing, FDR, Shelley Berman, Mia Farrow, Wolfgang A. Mozart. ARIES – March 20-April 19 – The Moon is in Aries from 11:07 am Wednesday till Friday night. You might be obsessed Wednesday regarding something to do with career ambitions or your salary, possibly spurred by upsetting news on how much someone else is being paid. Cardinal signs are very emotionally stressed Thursday morning. The Sun and Mercury enter your solar eleventh house on Saturday; you may join a club, group, or team, or act as a spokesperson for one. TAURUS – April 20-May 20 – The Moon is in Taurus from 8:36 pm Friday where it remains thru the weekend. Friday night is made for staying in and watching videos; have some popcorn on hand. You chant that new affirmation to yourself Saturday afternoon, and spend the next few hours getting lots done. The Sun and Mercury enter your solar tenth house of career on Saturday; your resume may receive scrutiny, and you could at last be called in for some interviews. GEMINI – May 21-June 20 – Your employer may need a cleanup Monday morning in order to open for business. Both good and bad news may arrive on Wednesday. A humorous friend is a great relief Wednesday night. The Sun and Mercury enter your solar ninth house on Saturday; you may embark on a long trip or go back to school in some capacity. There is also a chance you may see your words in print. CANCER – June 21-July 22 – A professional acquaintance may come to dinner Monday. Your mate is going through a bit of a crisis Wednesday. Cardinal signs are very emotionally stressed Thursday morning. The Sun and Mercury enter your solar eighth house on Saturday; you may be involved in a merger of some kind. LEO – July 23-Aug. 22 – A Monday morning illness should go away by midday. Health or workplace issues may come to a head on Wednesday. The Sun and Mercury enter your solar seventh house on Saturday; you may spend more time in one-to-one interaction, possibly in interviews or pairing up with a coworker on a project. VIRGO – Aug. 23-Sept. 22 – Your spouse may need to be driven to work Monday morning. Monday night a child may bring a date to the dinner table. Wednesday may bring issues of romance and intimacy to a head. The Sun and Mercury enter your solar sixth house on Saturday; you may be forced to pay more attention to health issues, which you prefer to handle by enrolling in group exercise classes. LIBRA – Sept. 23-Oct. 22 – Wednesday may bring the announcement of an addition to the extended family. Cardinal signs are very emotionally stressed Thursday morning. The Sun and Mercury enter your solar fifth house on Saturday; you may mentally be on vacation, or at least spending more time on creative outlets and games. SCORPIO – Oct. 23-Nov. 21 – A relative may announce an engagement Monday. Make sure to update computer security before Wednesday. The Sun and Mercury enter your solar fourth house on Saturday; you may spend more time at home with the kids or just cocooning. There is some chance of taking up the realty business. SAGITTARIUS – Nov. 22-Dec. 21 – On Monday night you may get some good advice or tip from a family member. Wednesday may see some financial strains or interrupted cash flow. The Sun and Mercury enter your solar third house on Saturday; you may get much busier with errands and speaking engagements. CAPRICORN – Dec. 22-Jan. 19 – You and Venus may invite a relative to dinner Monday. On Wednesday you may drastically change how you value yourself. Early Friday morning can be favorable for sales. The Sun and Mercury enter your solar second house on Saturday; you may find an accountant, or train yourself to do that job. Monday night favors having a relative over for dinner. AQUARIUS – Jan. 20-Feb. 17 – The Moon is in Aquarius as the week begins (it goes void at 3:37 am) until Monday morning. The Moon’s only aspect Sunday is a conjunction to Mars at 3:37 am, which might be a good time to get up and do your workout indoors; try not to get into a fight with your mate. The rest of Sunday, stick to routine. The Sun and Mercury enter your sign on Saturday; you may be the focus of attention, getting your name in the paper or online, being interviewed by the press, and meeting tons of new people. PISCES – Feb. 18-March 19 – The Moon is in Pisces from 5:49 am Monday till midday Wednesday. Pisceans will be Mr Foggy-head during their Monday morning commute, so try to look alive. Dinner hour favors having a dear guest at the table. You might be up till midnight doing chores. Meet a friend for breakfast Wednesday. The Sun and Mercury enter your solar twelfth house on Saturday; you may go on a group retreat, or volunteer at a hospital. There is also the chance that repressed feelings or memories will bubble up and appear in your journal. Venus in Capricorn trines Jupiter at 1 degree Taurus at 4:23 pm Sunday. Venus trine Jupiter is very fond of pleasure and is self-indulgent. Earth signs may be especially prone to overeat or overindulge in other ways. But a great time to enjoy the abundance of the harvest and all the good things in life with those around you. The Sun in Sag squares Mars at 9 degrees Virgo at 8:08 am Friday. Sun square Mars is very competitive and digs in his heels. This is more true if you are in a sports contest, but can apply to contests in your office (who sells more) or the mostly friendly bowling league. You may get drawn into a long duel (best 3 of 5, then best 8 of 15, and so on). Promise the other party a rematch and get back to whatever else you were doing. ARIES – March 20-April 19 – Sunday afternoon’s Venus-Jupiter trine throws some financial luck your way. Your timing is perfect early Tuesday. Your friends present good arguments on Wednesday. Career issues may come to a head on Thursday. You’re very competitive at work Friday, I mean that in a good way. The Moon is in Aries from 8:51 pm Saturday thru the weekend. You may feel a bit emotionally upset by someone Saturday night, but try to let it slide off your shoulders. TAURUS – April 20-May 20 – Your efforts Sunday are rewarded with pleasant relaxation Sunday pm, a treat from an older person. Career frustrations may come to a peak on Tuesday, but this may be relieved by some legal or publishing good news on Thursday – which you might celebrate that night with some compatible friends or relatives on a modest night out. Your kids may be especially competitive Friday so make a point of attending their games. GEMINI – May 21-June 20 – Spending time Sunday in your private retreat will be pleasurable, and provide your quota of mental health credits. You connect with an unusual friend early Tuesday. Your mate gets a good review Tuesday. You are up late Wednesday with a serious discussion. Career matters take an upturn Thursday; possibly the company gets an expansion loan. Friday morn may be rather stressful and yet it presents opportunities if you are aggressive in pressing your interests. CANCER – June 21-July 22 – The week starts with the Moon in your opposite sign, making you think your mate is unusually moody or sensitive. Connect with a brother over Sunday brunch, then invite friends over for supper. Monday pm is emotionally stressful so don’t hold a dinner party. Concerns about money gather focus until on Thursday you realize how obsessed your mate is about it, and about controlling others via money. It’s up to you to set him straight. Thursday pm is much more harmonious, but on Friday it’s the siblings and kids acting up. Sigh. LEO – July 23-Aug. 22 – Career matters could take a positive turn Sunday or Monday. You may have trouble getting siblings to agree on holiday schedules Monday. Career may be stressful Tuesday, but it may just be the company’s growing pains. The kids may talk your ear off Wednesday morning, or creative writing flows easily. Cash flow may be the issue at work Thursday, this may mean problems getting customers to pay. The kids and your in-laws are not seeing eye-to-eye Friday. Friday in general is a stressful day for many, so you might counsel everyone to think things over. Your lawyer or your editor has a brilliant insight over the weekend. VIRGO – Aug. 23-Sept. 22 – Virgo can be quite productive Sunday under the Venus-Jupiter trine; you might create gifts, or cook up a home buffet spread. You or the kids might be a bit depressed Monday over budget matters, perhaps over the limited gift budget – but you can give tips on how to stretch a buck. Your mate has quite a pleasant day Thursday, and you catch the reflected glory. Friday is stressful for you re balancing work, home and family needs; give yourself a break and admit that not everything can be perfect! An insurance payment is very timely late in the week. LIBRA – Sept. 23-Oct. 22 – Family matters and family gatherings take up a great deal of your time Sunday, and someone may have a wonderful piece of good news to share. Someone may not want to hear your good advice on Monday, but you may find a more receptive audience on Wednesday night. Your siblings hit it off with your kids Tuesday. Somehow the atmosphere at home is marred by trying to control others with money, and your job is to prevent that. Take care of health checkups that afternoon before the holidays crowd everyone’s schedules. You may make a great effort Friday to get caught up with correspondence. SCORPIO – Oct. 23-Nov. 21 – You, your spouse and some friends have a wonderful time Sunday; plan something special. You may have to say no on Monday. Tuesday is a mixed bag. Family finances look OK, but there is pressure to spend more. Resist. Good financial news may be in the in-box Wednesday am. You may be rather startled by a sibling’s obsession Thursday. The Moon in compatible Pisces Thursday pm smiles on creative pursuits and on children. Avoid loaning money to a friend on Friday. Try to avoid stomach upsets on Saturday. SAGITTARIUS – Nov. 22-Dec. 21 – You easily break the gifting budget on Sunday. You may have to say no to friends on Monday. A sibling’s health may be the only obstacle in making holiday plans Tuesday. Your sales talk finds a receptive audience Wednesday morn. Your bank account is either overflowing or busted by Thursday, probably the former because I see you handing out early holiday treats to family coworkers. Friday is the most stressful day of the week, with everyone pulling to meet deadlines. Children are very funny Saturday. CAPRICORN – Dec. 22-Jan. 19 – The Moon is in Capricorn from Sun.-Tues. am. You take control of the household early Sunday and set out the agenda for everybody, tho frankly, acting like a general may not endear yourself to family members. But having rounded up volunteers, you accomplish a great deal by midday. Monday is a hard-working day. You may be upset about the financial situation of a child of yours on Tuesday. On Thursday you may try to control someone you love (THAT isn’t very loving). Saturday night is spent with home and family, one of whom may stop you in your tracks. AQUARIUS – Jan. 20-Feb. 17 – The Moon is in Aquarius from 2:02 am Tuesday till Thursday morning. An odd dream may make you laugh Tuesday. Pinch pennies early in the week and you will have plenty on the weekend. You find a friend Tuesday. Chatting makes the day pass faster Wednesday. You can inspire yourself Thursday morning and that can carry you thru the whole day. The Venus-Pluto conjunction Thursday could cause you to shoot yourself in the foot; get a hold on yourself and talk things over with a trusted person. PISCES – Feb. 18-March 19 – Invite friends and siblings over for Sunday dinner; Venus promises convivial company. The Moon is in Pisces from 9:45 am Thursday till Saturday night. You enjoy a Thursday lunch with a sibling or neighbor. Talk things over with a mentor-type Thursday night. Friday morning has some temporary friction, but you are in a competitive state of mind. You might try a new way of getting work done Saturday. Super Bowl Sunday on Feb. 6 looks rather interesting. The Sun-Mars conjunction in Aquarius trines Saturn at 17 degrees Libra in the wee hours (1:40 am), and Venus is square Jupiter at zero degrees Aries at 2:49 pm. The Moon is conjunct Uranus in Pisces in early afternoon, but moves into Aries and soon is conjunct Jupiter in Aries that night. I am writing a separate article on the astrology of the 2011 Super Bowl, but as for mundane matters, these aspects are favorable for taking action and showing leadership. Venus is conjunct Pluto at 6 degrees Capricorn at 8:52 pm Wednesday. (The Moon in Taurus trines the conjunction.) Well, this is a little too close for comfort to my third house cusp again. Recall how I told you the story of my computer getting zapped by an online attack under the Sun-Pluto conjunction. Venus conjunct Pluto represents intense feelings welling up, sometimes marred by jealousy or guilt or other fun stuff like that. Now, I am a little too old to do it in the car, which is another third-house interpretation. Perhaps a short trip is in order. I’ll tell ya what happens next.